Fisher’s offer customers the latest heat treatment services to ISPM 15 – “International Phytosanitary Standard for Wood Packaging 15”. Ability to process thousands of export pallets to ISPM15 every week. State-of-the-art kilns, purpose-built for new pallets. 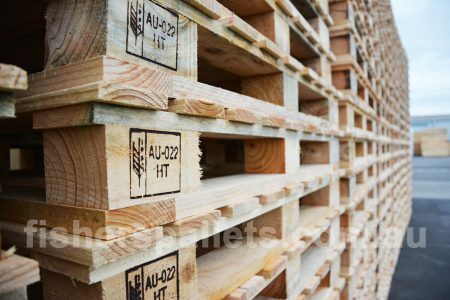 ISPM 15 compliant Dunnage is also available to your requirements. Certificates are available if required – electronic data is retained to show a full audit trail. Fisher’s have commissioned a kiln which will heat treat our pallets at 56 degrees centigrade for 30 minutes (the 56/30 rule). We have installed state-of-the-art paperless recording system to monitor the core temperature of the pallets and built new shedding to keep the pallets dry after treatment. The gas fired kiln has the capacity to treat 500 completed pallets at a time. The kiln uses a 1250 mj LP Gas burner complete with modulated gas system for accurate automatic temperature control. This provides enough energy to quickly lift the temperature of the pallets and then modulate down to maintain a minimum temperature of 56°C for 30 minutes.